It has been way.... too long for none blog posts at all for almost a year. I have a good excuse which I was busy with my school and now business. Have you ever heard of Merch by Amazon? I would like to introduce you to my new eCommerce business which is a platform that I am selling customized- designed T shirts on Amazon. If you are searching on Amazon and can search for Moo Noy. I designed fun and Lao inspired quotes and sayings. I had to find all the information and miscellaneous I could find in a short period of time on the internet and I don't know the ins and outs much yet. I am not even scratch the surface of selling online and I am such a novice. However I am happy to find this platform to find way to make money. There are numerous of ways to sell physical products online and Amazon market place is another channel that I am not going to get into it yet. For right now I am still trying to figuring out to get multiple income streams either selling online, through traditional businesses or side gigs so that I don't have to rely on JOB. 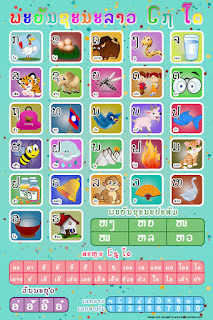 Therefore I have created my Lao Alphabet Chart for Kid or Lao learners. I'll post the picture here. This chart is Priced at $15.99 and shipping depends on where do you live and for now the shipping is only in the US and if you live in other part of the world shoot me an email for a quote. For now I can only accept purchase though email. 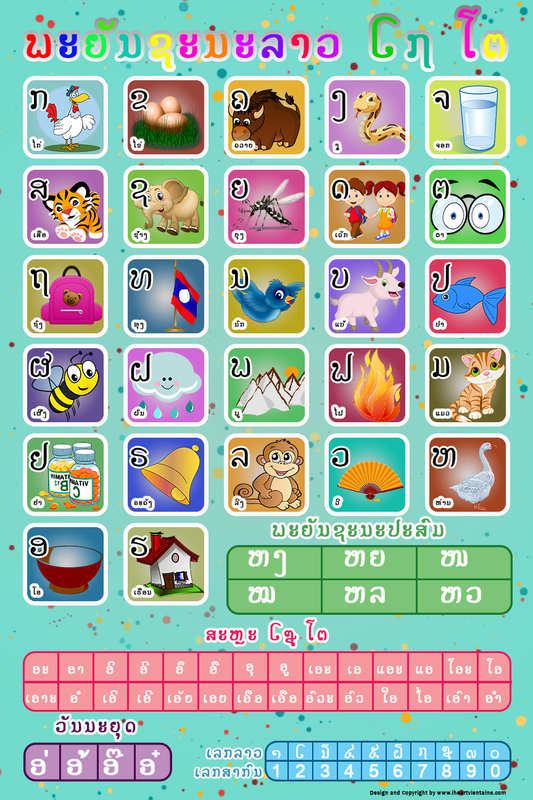 I would also love to do a give away (Lao Alphabet Chart for Kids) next month to one lucky winner! The contest will be start to the next blog post. ກໍດົນພໍສົມຄວນທີ່ບໍ່ໄດ້ຂຽນບົດຄວາມລົງ blog ເກືອບຮອດປີ. ແຕ່ຂ້ອຍກໍ່ມີຂໍ້ແກ້ຕົວທີ່ດີ ເພາະຫາກໍ່ຮຽນຈົບ ແລະ ເລີ່ມທຸລູກິດໃໝ່. ເຈົ້າເຄີຍໄດ້ຍິນ Merch by Amazon ບໍ? ຂ້ອຍຢາກນຳສະເໜີ ທຸລະກິດອອນໄລ ທີ່ຂ້ອຍຂາຍເສື້ອທີ່ ອອກແບບ ທີ່ ຂ້ອຍຂາຍທີ່ Amazon. ນີ້ແມ່ນຮ້ານຂ້ອຍ Moo Noy ຖ້າເຈົ້າຊອກຢູ່ ອາເມຊອນ. ຂ້ອຍອອກແບບທີ່ຕະຫຼົກ ແລະ ຈາກຄຳສັບສັ້ນໆ. ຂ້ອຍໄດ້ຊອກຫາຂໍ້ມູນຕ່າງໆ ແລະ ນັ້ນໆນີ້ໆ ຈາກອິນເຕີເນັດ ໃນເວລາສັ້ນໆ. ຂ້ອຍຍັງບໍ່ຮູ້ລູ່ທາງຄັກແນ່ແທ້. ການຂາຍທາງອອນໄລແມ່ນມີຫຼາຍຂ້ອຍຍັງຮູ້ແຕ່ພື້ນໆ ແລະ ຍັງຖືວ່າຍັງອ່ອນຫັດຢູ່ ແຕ່ຂ້ອຍກາດີໃຈທີ່ໄດ້ຫາຊ່ອງທາງອີກອັນໜື່ງທີ່ໄດ້ຈະຫາເງິນ. ມັນກາມີຫຼາຍວິທີທີ່ຈະຂາຍຂອງອອນລາຍ ແລະ ຂາຍຢູ່ ອາເມຊອນ ກໍ່ແມ່ນຊ່ອງທາງໜື່ງ ແຕ່ຂ້ອຍຈະບໍ່ກ່າວເຖີງເທື່ອ. ປະຈຸບັນ ແມ່ນຂ້ອຍກຳລັງຊອກຫາຫຼາຍຊ່ອງທາງທີ່ຈະຫາລາຍໄດ້ ບໍ່ວ່າຈະແມ່ນ ຈະຂາຍທາງອອນໄລ, ເຮັດທຸລະກິດອື່ນໆ ຫຼືແມ້ກະທັ່ງ ຫາລາຍໄດ້ເລັກໆນ້ອຍໆອື່ນໆ ໂດຍບໍ່ຈຳເປັນຕ້ອງເຮັດວຽກປະຈຳ. ສະນັ້ນຂ້ອຍໄດ້ເຮັດ ຕາຕະລາງອັກສອນລາວສຳລັບເດັກ ຫຼື ຄົນຮຽນພາສາລາວໃໝ່. ຂ້ອຍຈະເອົາຮູບລົງໃນ ບົດຄວາມ blog ນີ້ເລີຍ. ລາຄາ ແມ່ນ $ 15.99 ແລະ ບໍ່ລວາມ ຄ່າສົ່ງໄປສະນີ ແລະ ມັນກໍ່ຂື້ນກັບວ່າເຈົ້າຢູ່ບ່ອນໃດໃນອາເມລິກາ ແລະ ຈະມີແຕ່ສົ່ງໄປສະນີໃນອາເມລິກາເທົ່ານັ້ນ ກະລຸນາຖາມຄ່າສົງຖ້າຫາກທ່ານຢູ່ ບ່ອນໃດໃນໂລກ ຕ້ອງຂຽນອີເມວມາຖາມລາຄາກ່ອນເດີ. ປະຈຸບັນຍັງຮັບການຊື້ຜ່ານທາງອີເມວ ແລະ ເດືອນໜ້າຂ້ອຍຈະເຮັດການແຈກ ຕາຕະລາງອັກສອນໃຫ້ຜູ້ໂຊກດີໜື່ງທ່ານ. ການແຂ່ງຂັນແມ່ນຈະເລີມໃນບົດຄວາມ blog ບົດຕໍ່ໄປ. ຂອບໃຈສຳລັບການສະໜັບສະໜູນ ແລະ ຂ້ອຍກໍັ່ຫວັງຢ່າງຍິ່ງວ່າ ພວກທ່ານຈະພໍໃຈກັນສິນຄ້າທີ່ຂ້ອຍນະສະເໜີ ແລະ ຍິນດີຕ້ອນຮັບຄຳຕິຊົມ ແລະ ຄະແນະນຳ. Picture and content are copy righted to I Heart Vientiane. Any part or whole published without any notice consent will be prosecuted.